When Facebook launched its long-awaited video chat devices Portal and Portal+ last week, many were understandably concerned about its implications for data protection and privacy. After the widely covered Cambridge Analytica scandal and recent Facebook data breach, inviting the social media giant into the home seemed like a step too far for some consumers. "Portal voice calling is built on the Messenger infrastructure, so when you make a video call on Portal, we collect the same types of information (i.e. usage data such as length of calls, frequency of calls) that we collect on other Messenger-enabled devices. " "We may use this information to inform the ads we show you across our platforms. Other general usage data, such as aggregate usage of apps, etc., may also feed into the information that we use to serve ads." Ads are obviously where Facebook makes its money, though it's not clear whether Facebook's original claim – that it would not collect data from Portal users – was a simple mistake by its communications team, or something less innocent. This news comes just one week after a huge data breach that compromised the security of 30 million Facebook users, and public trust in the social network has been in steady decline, even if user numbers haven't followed the same trend. 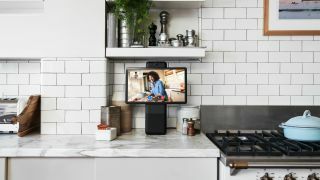 The new video chat devices are currently available only in the US for pre-order, though how much the Portal takes off may largely depend on how much more personal data users are willing to entrust.